Show Your Works. Order Your Studio Demos Today! Your brides will love our photo album styles. Don't settle with the old school law book bulky albums from your Grand Father era. We offer more album styles and options that will help you bringing in more clients. We have styles for everyone and our photo albums are more affordable than ever. 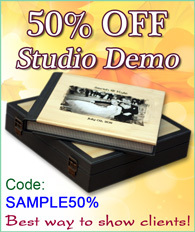 Get your studio sample photo album half-priced now. Order today! Studio samples are half-priced. Enter 'SAMPLE' discount code at checkout. We will imprint 'SAMPLE' across on the last album spread to indicate the sample album is for showcase demo only. After checkout, you will be given a link to upload your files. If you encounter problems uploading files, just email us a link to download your files or email us info@amcimage.com or call 1-312-829-1090 for assistance.